It’s the new year and you’re feeling refreshed and ready to take on the new school year. But suddenly the overwhelming feeling of stress mysteriously arises as the start of the school year is fast approaching and you are crippled by those burning questions, “How will I organise my artroom?”, “Which materials will I need?” and “What activities can I create that will really engage my students without causing a huge mess?”. 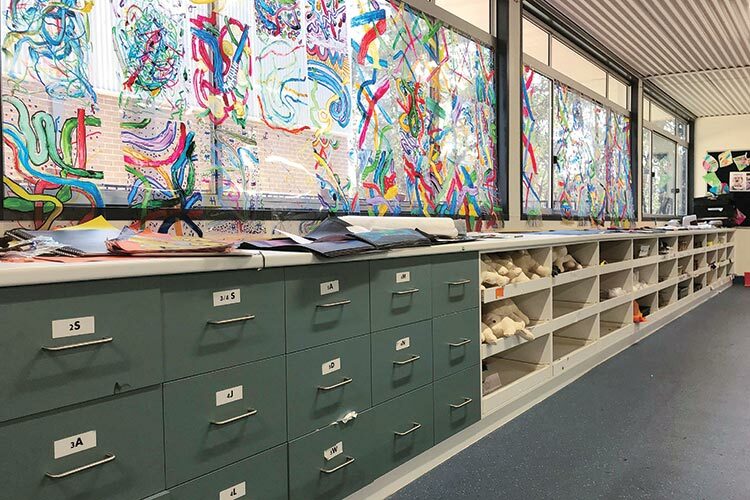 Instead of spending hours searching the Internet whilst feeling overwhelmed, we have compiled 10 super-simple and effective artroom hacks to give you the confidence to take on the 2019 school year. Sick of basic consumables eating into your budget? Cut down time, waste and sticky mess with these new glue sticks! Bright purple and easy to see when being applied means students are less likely to waste glue and accidentally get it all over the tabletops (and it easily washes off hands and tabletops if they do). Don’t worry, it dries clear, so it will have no impact on the appearance of artwork. With its non-toxic formula, very strong bond and easy-to-use size for small hands, this is a must-have in every artroom this year. Let’s hope that after being on school holidays, students haven’t forgotten everything they learned last year. But just in case, the first week back is a great time to ease students into the school year and refresh some of those basic skills and knowledge. What better place to start than with colour theory? This Cardboard Colour Wheel Template is a perfect learning tool to ease them into the new year. You don’t have to spend hours making your own or printing them out from a poor-quality image found online. The thick 300gsm cardboard surface allows students to achieve vibrant results without the surface becoming warped and crumpled (note it’s best to mix the colours on a palette first). Students will have a very useful self-created learning tool that they can refer to throughout the year. Rubber Rollers are such a useful tool but we often put them into the too hard basket because of the perceived difficulty of clean-up. This EasyClean Rubber Roller comes with a detachable plastic handle, allowing stubborn paint marks to be washed away with ease from along the rubber surface and the roller attachment, which can impact the lifespan and performance of the roller if not cleaned properly. In addition, both time and water are saved during pack-up, as you no longer spend valuable lesson time over the sink furiously scrubbing and cleaning each roller. These Adhesive Felt Sheets eliminate the need for using messy glue which can make your artwork or table tops sticky and messy. Easy to cut, layer, stitch and decorate. If you are planning to explore quick and easy collage or textile projects with your class without the mess, Adhesive Felt Sheets are your answer. Spray painting is generally perceived as expensive, messy and potentially harmful to both the environment and students. However, spray painting often is one of the most successful ways to engage your students in learning art. The YouCan Air Powered Refillable Spray Can allows you to turn any non-toxic paint, ink, dye, adhesive or any other liquid substance into a high performing spray. Using only natural air that is pressurised with a bike pump, this environmentally friendly alternative contains no propellant or solvent, making it very safe for students to use indoors or outdoors. Protective gear such as a respiratory mask, safety glasses, gloves and a smock are always suggested when using any spray methods. Don’t waste your precious budget re-ordering plastic rulers that are easily ruined when students mis-use knives along their edge to cut straight lines. Specifically designed for cutting and technical drawing, Acrylic Cutting Rulers are strong, sturdy and come with a metal edge for cutting, which prevents dents that cause curvy lines. Unlike metal rulers, you can easily see through them to show the surface below when cutting, making drawing grids or patterns a breeze. Students commonly struggle to cut out detailed designs with scissors or knives in a controlled manner. The Excel Index Detail Knife allows you to cut shapes as if you were holding a pen, giving you far greater control, allowing you to make smooth curves and fine points. Blades can simply be replaced with Precision Blades; no need to buy a new knife each time. The Portable Folding Crate Trolley will be very useful for teachers constantly on the move. Use it as a storage place for materials and for transporting heavy objects without straining yourself. Its unique folding ability takes up minimal space in your artroom, office, car or home for easy storage and transport. A budget-friendly way for your students to make mini silk screens and create small detailed work. No need to buy an expensive silk screen – simply stretch the silk mesh and you’re ready to go! Alternatively, stretch silk, calico or cotton material over the adjustable Embroidery Hoop and use it for silk painting, batik or embroidery. The best part is, they can be re-used! A simple way to make your budget stretch that little bit further. It’s important to experiment with a variety of media and substrates as an Art Educator. These White Ceramic Bisque Tiles are ready to decorate with either acrylic paint or earthenware or stoneware glazes. This easy-to-use surface also works well with transfer tissue, mosaic tiles and paper collage, and can be used for creating murals and coasters, or as a quick way to experiment with techniques and designs for a final piece. Start mixing and matching and see what results you get! With any luck, you’ve found some inspiration and a starting point from this list and, hopefully, saved time researching. Hopefully, with these 10 artroom hacks up your sleeve, the new school year seems a little less daunting. At Zart, we are here to support teachers in creative education now and into the future.